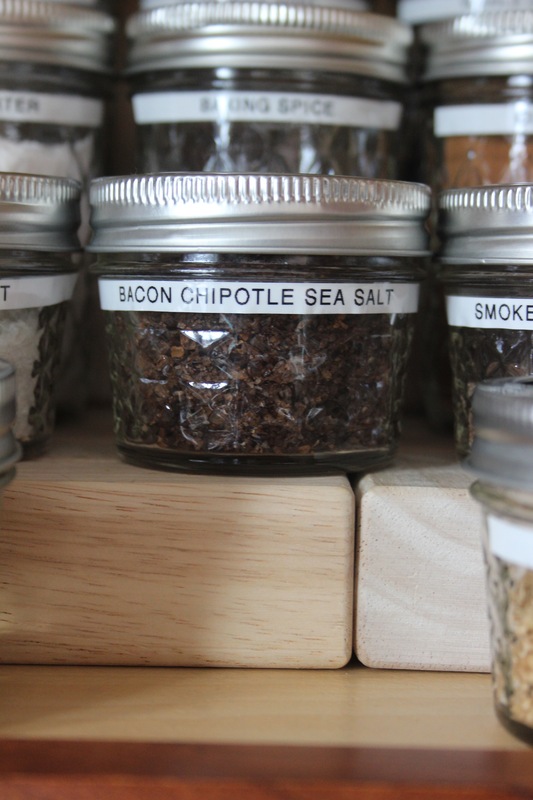 What does your spice cabinet look like? Ours was overflowing with unmatched jars and bottles- some new, some old, some we’d be hard pressed to remember buying. 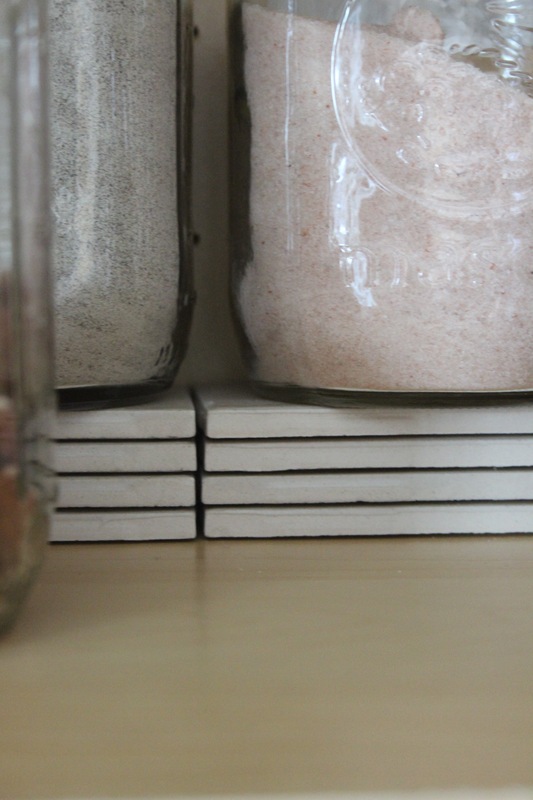 They were shoved in their little cabinet one behind the next, without enough room on the little spice jar step stool we bought, and we found it difficult to ever find what we were looking for. That is when we started Pinteresting ideas to solve this problem. We don’t have a pull out spice cabinet. 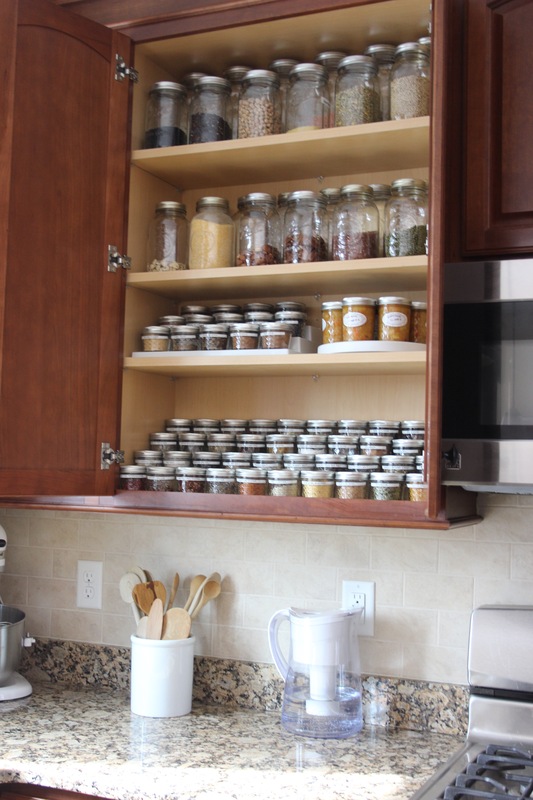 We don’t have an extra large drawer devoted to spices lying down…and we didn’t want to spend much money on this project. We do have a big kitchen, some canning jars, a label maker, old tiles and a box of children’s blocks (shhhh…don’t tell them). 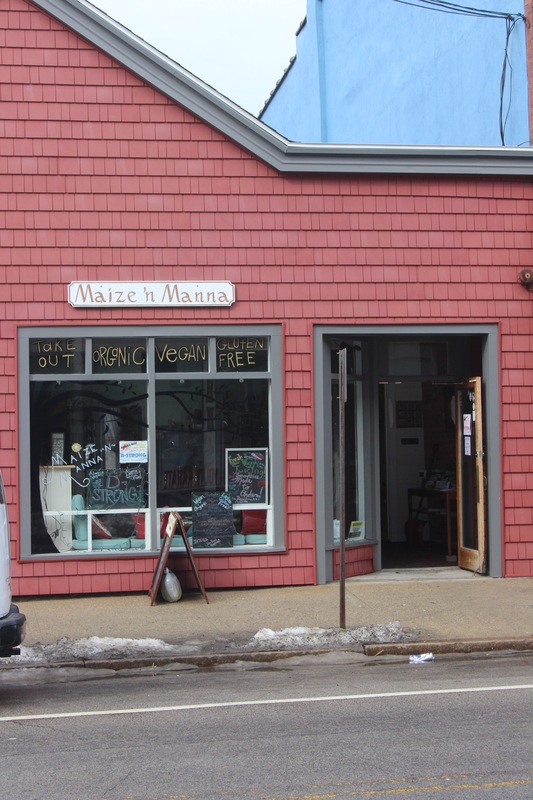 In our town there is a fabulous little shop called Maize ‘n Manna. 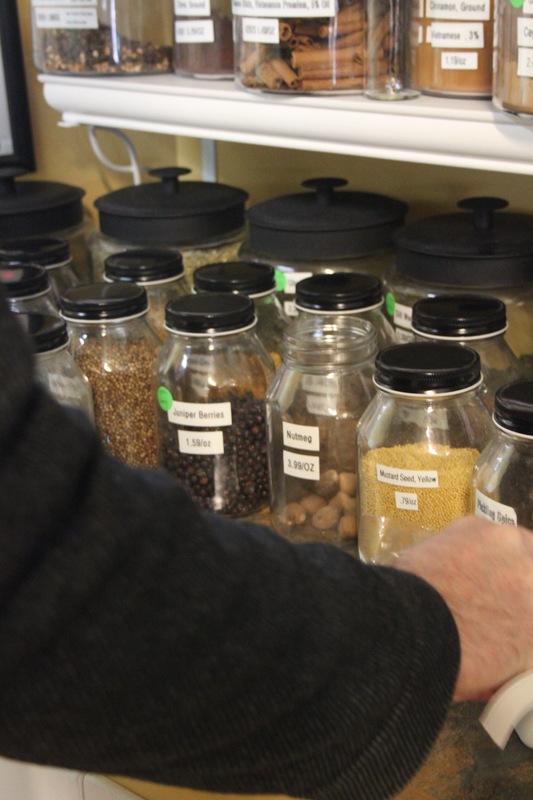 They sell spices and other pantry staples in bulk (or… by the tiny pinch). With a great selection it makes finding what you need easy. 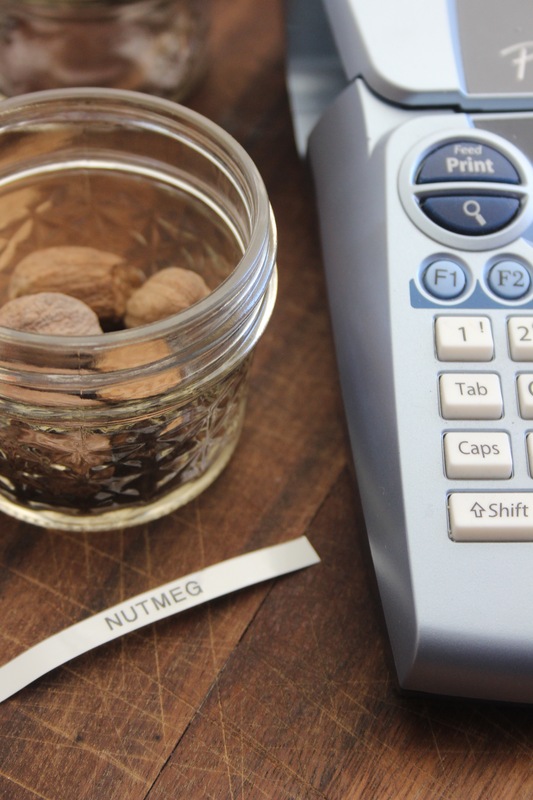 It also means you won’t be left with an entire jar of something you might only use once. 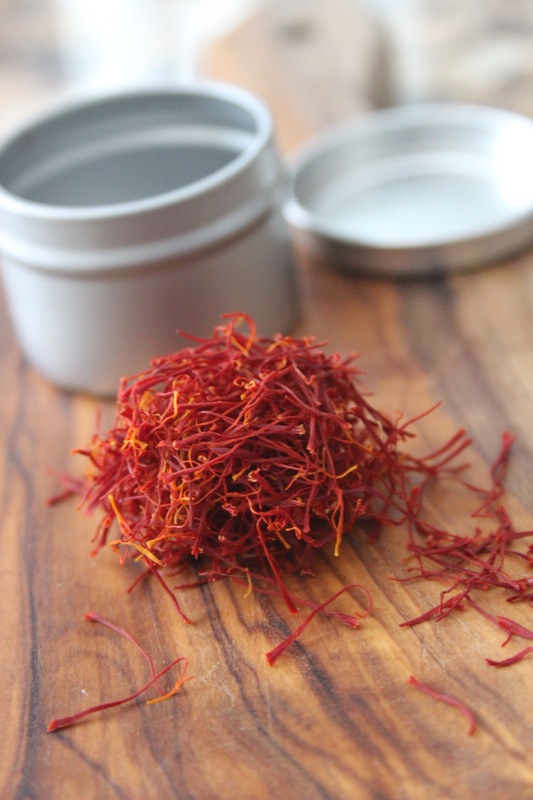 We came home with some really good saffron, juniper berries and Vindaloo. 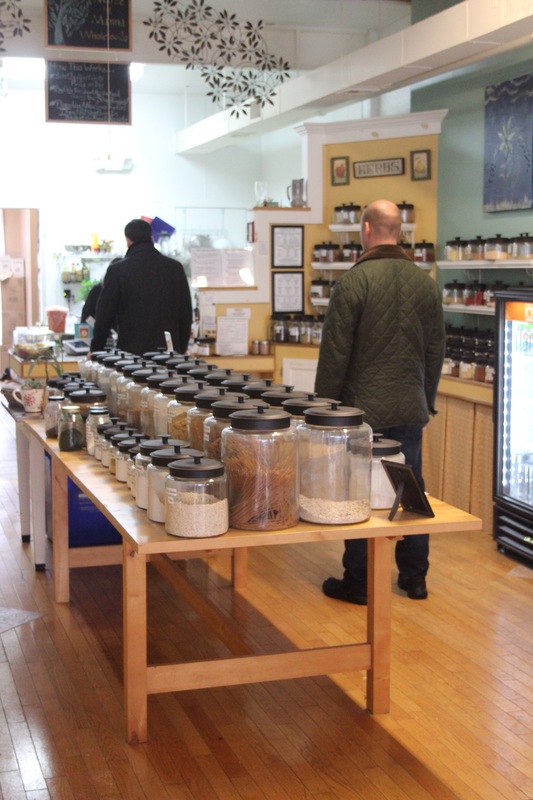 Just something to consider- buying from a small spice shop ensures fresh spices and allows you to buy as much as you need- in our case it also supported a local small business which we love. 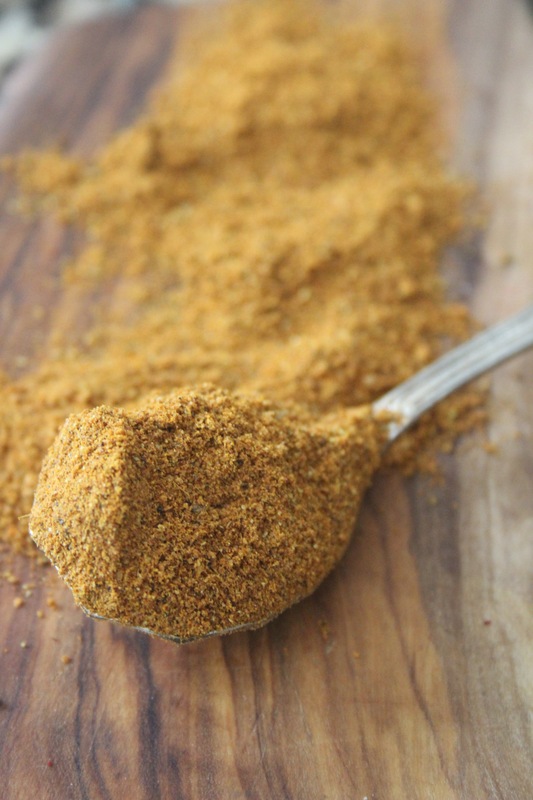 Truth be told we are pretty good about using our spices. 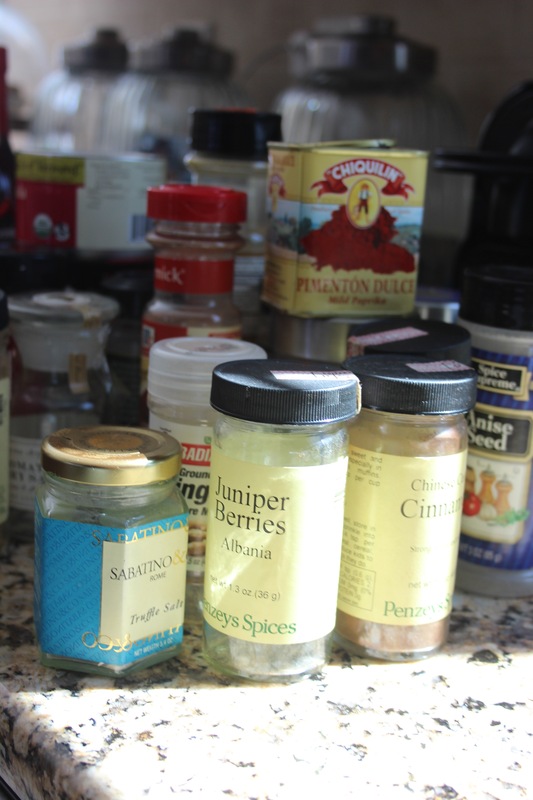 We have lots, but we do cook with them so we don’t feel the need to really purge (except of course if they are old). 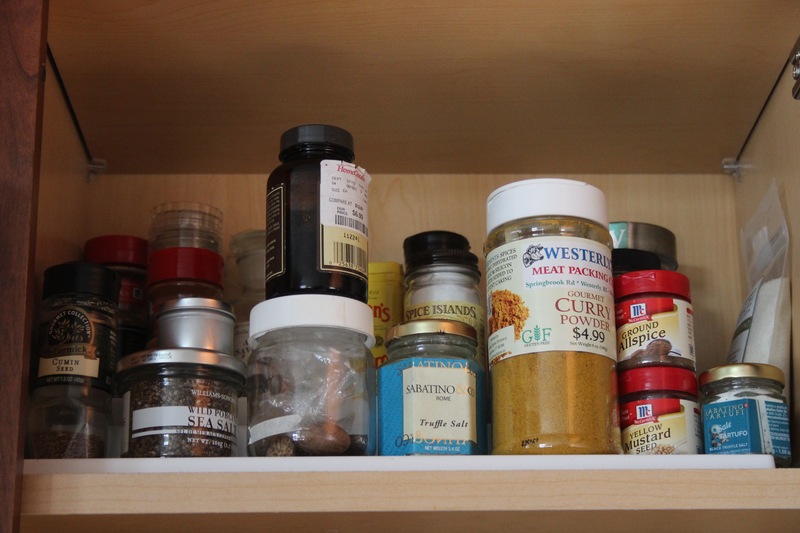 So every single spice came out of the cabinet. 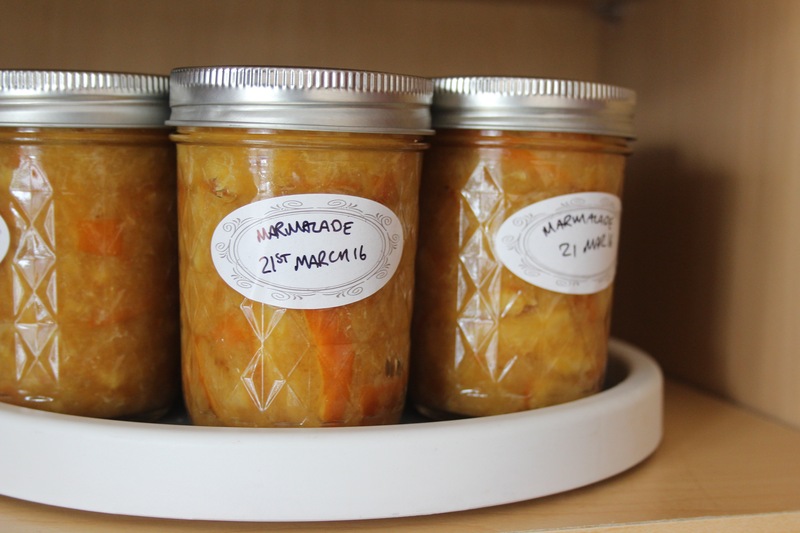 Each bottle and jar were carefully poured into a 4 or 8 oz. canning jar. 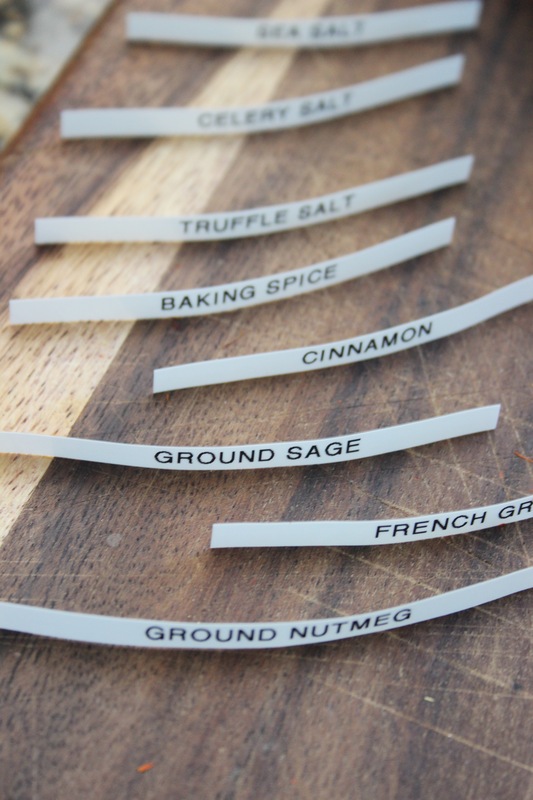 Our fabulous little label maker got a full days work as the spice names were typed out one by one. We suddenly had a recycling bin full of empty bottles and a counter full of glass jars. We realized at that moment that they were not going to fit back in the small cabinet they had been calling home for the last year. So we had to make a hard decision. 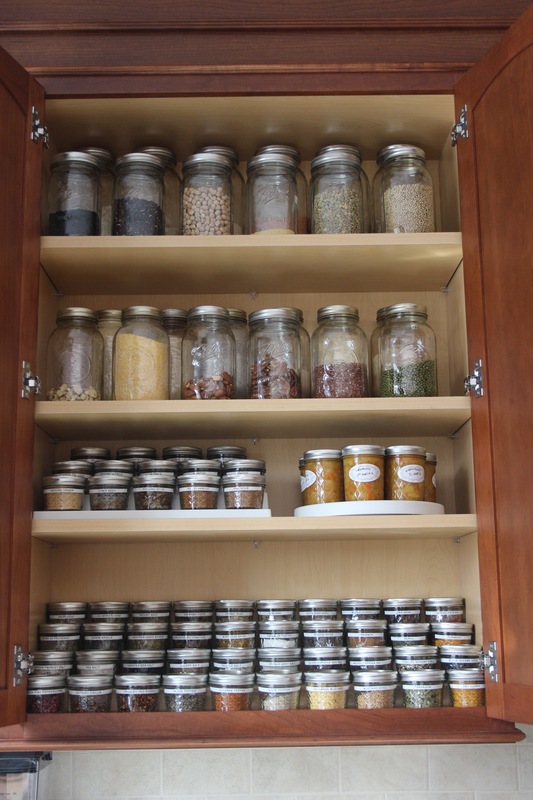 The white dishes were going to have to find a new home in a much smaller cabinet so our spices could spread out. We also had to “borrow” our children’s pine colored building blocks (just until we can get some wood cut) to make the “shelves”. 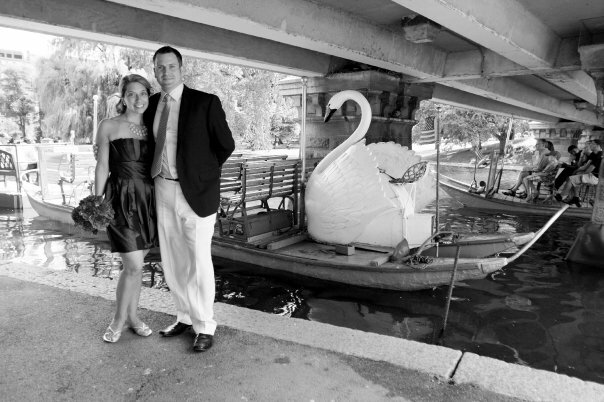 Considering they were a free option…they have worked out just GREAT! 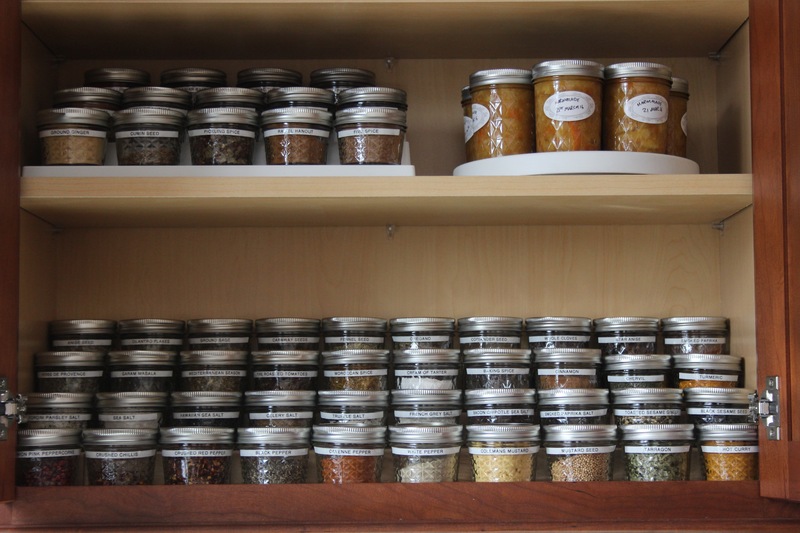 Call it what you will…I can open that cabinet and have a Calgon moment. It can make a bad day feel good. 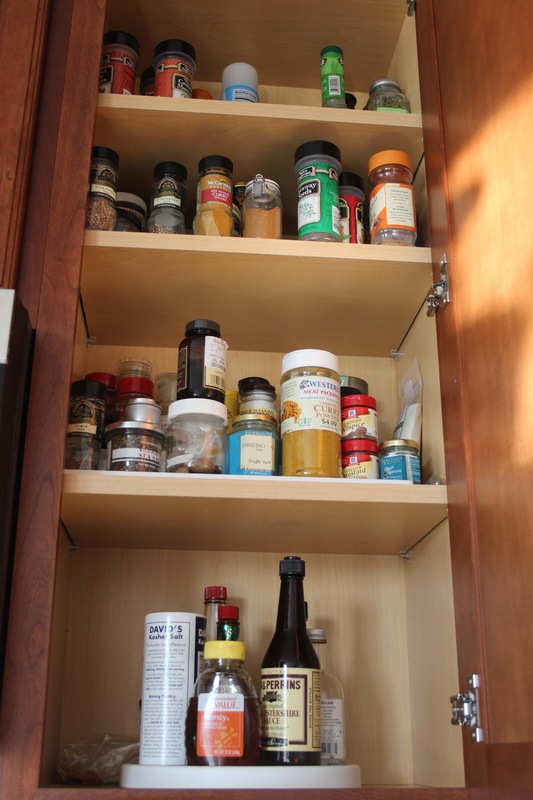 Just don’t get too annoyed with us if we ask you if you’d like to see our spice cabinet when you come over to visit.